1989Obtained BS in Applied Physics, Shanghai Jiao Tong University, Shanghai (China). 1991Obtained MS in Physics, University of New Mexico, Albuquerque (N.M.). 1997Obtained PhD in Physics, University of Colorado, Boulder, Boulder (Colo.). 1997 – 1999R. A. Millikan Postdoctoral Fellow, California Institute of Technology. 1999 – presentJILA Associate Fellow (1999-2001); Assistant Professor Adjoint (1999-2003); JILA Fellow (2001-present); Associate Professor, Adjoint (2004-2006); and Professor Adjoint (2006-present), University of Colorado, Boulder, Boulder (Colo.). 1999 – presentJoint Institute for Laboratory Astrophysics (JILA) Associate Fellow (1999-2001); Physicist (1999-2004); JILA Fellow (2001-present); and Fellow (2004-present), National Institute of Standards and Technology, Boulder (Colo.). 2006 – presentGuest Professor, Shanghai Jiao Tong University. 2007Awarded I. I. Rabi Prize, American Physical Society. Atomic, molecular, and optical physicist. 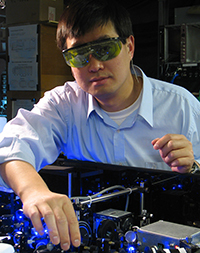 PhD advisor at University of Colorado, Boulder in Optical Metrology and Quantum Optics. Both employed at Joint Institute for Laboratory Astrophysics (JILA). Post doctoral advisor at California Institute of Technology. Both employed at National Institute of Standards and Technology and University of Colorado, Boulder. R. A. Millikan Postdoctoral Fellow. Joint Institute for Laboratory Astrophysics (JILA) Associate Fellow; Physicist; Joint Institute for Laboratory Astrophysics (JILA) Fellow; and Fellow. Obtained BS in Applied Physics (1989). Guest Professor. Obtained PhD (1997). Assistant Professor Adjoint; Associate Professor Adjoint; and Professor of Physics Adjoint. Fellow and received 2007 I. I. Rabi Prize. Obtained MS in Physics (1991).